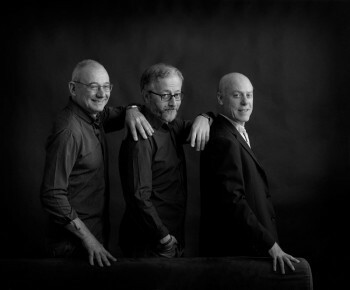 The Trio Malinconico, was born some years ago from the willingness of a writer and two jazz musicians to unite music and literature in a show that could allow both forms of expression to connect in a common language. Spacing from readings of extracts to mostly improvised performing, laughs and food for thought, Trio Malinconico – in an unplugged, essential lineup featuring a double bass and saxophone – will amuse and impress the public in a rhythmic show that recreates the feeling of the written text. Diego De Silva, is a writer. His books, published by Einaudi, include the four-volume saga devoted to unsuccessful lawyer Vincenzo Malinconico (Non avevo capito niente, Mia suocera beve, Sono contrario alle emozioni and Divorziare con stile), as well as Certi bambini and Terapia di coppia per amanti, and the recently published pamphlet Superficie. Stefano Giuliano, saxophonist, has been the director of the Salerno Jazz Orchestra since 2007 and regularly performs with Tom Harrell, Peter Erskine, Randy Brecker, New York Voices, Diane Schuur, Roberta Gambarini, Bob Mintzer, Dee Dee Bridgewater. Aldo Vigorito, double bassist, has collaborated with different musicians like Stefano Bollani, Fabrizio Bosso, Paolo Fresu, Richard Galliano, Roberto Gatto, Javier Girotto. In 2010 and 2011 he was mentioned among the best Italian double bassists by the magazine Musica Jazz.